This rare drawing was made by Ian Fairweather while he was a student at the Slade School in London between 1920 and 24. 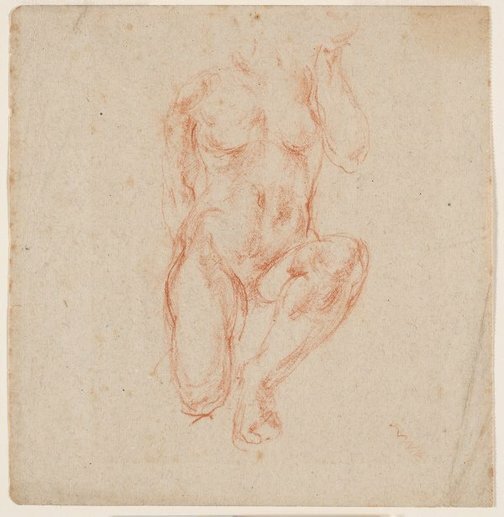 The Slade School had a strong focus on figure drawing, as the foundation of art, and promoted a formulaic approach to drawing the figure that emphasised anatomical correctness. Fairweather approached his subject with his characteristic lyricism and subtlety, suggesting form through tone rather than line, and reveal his comprehension of movement and structure. Philip Bacon, Ian Fairweather , Brisbane, 1984, 18. Tim Fisher, The drawings of Ian Fairweather , Port Melbourne, 1997, 7 (illus. ), 62.